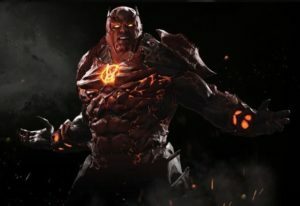 This page contains a character guide for Atrocitus in Injustice 2. Here you’ll find movelists, combos, juggles and strategy guides and recommended gear for the villain character. For more Injustice 2 content, head over to our Injustice 2 top page. Atrocitus, formerly known as Atros, was a native to the planet Ryut in Space Sector 666. For a time, he lived a peaceful life as a psychologist. But that ended when a programming malfunction occurred in the universe’s then-protectors, the Manhunters. The cybernetic androids slaughtered the entire Sector, leaving only a handful of survivors (he was included among the survivors). Blaming the incident on the Guardians, he swore vengeance. Eventually, Atrocitus founded the Red Lantern Corps, becoming the first Red Lantern. Fueled by rage instead of willpower, he dedicated his Corps to fight the Guardians and all who aligned with them, including the Green Lantern Corps. Napalm Vomit does damage over time to the opponent. Up Napalm Vomit does damage over time to the opponent. Atrocitus drains health from the opponent. Meter Burn ↓ ↓ R2 ( must press ↓ ↓ R2 once enough blood has been drained and Atrocitus starts to pulsate). Atrocitus summons his cat Dex-Starr to assist him during the fight. Below are combo and juggle inputs for Atrocitus, including corner strategies and restarts.